Induction brazing delivers the heat to the joint area only. This feature creates a perfectly brazed joint, which also improves the visuals. This is very important for for instance automotive manufacturers. Brazing with induction is fast, energy use is minimal and your output increases in high volumes. Need we say more? Induction brazing dosn't expose the employers to open flames, unlike the ovens or torches. Induction heating localizes the heat precisely at the brazing area, which doesn't affect the outside temperature. It contributes to a pleasant working environment and the health of the personnel. Last but not least, it is perfect for copper, brass, aluminum or steel. And, you can easily braze two different materials, because the process is controllable. Are you currently applying brazing in your manufacturing process? Consider induction heating for improving your brazing application. 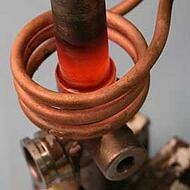 Ambrell has over 30 years of induction heating experience and brazing is the area of our know how. Visit our knowledge center or simply request a lab service for complimentary analysis. Learn more about our versatile product line for your brazing application and contact us for a tailored solution. Interested in Ambrell developing a brazing solution for you? Download our brochure or contact us today!